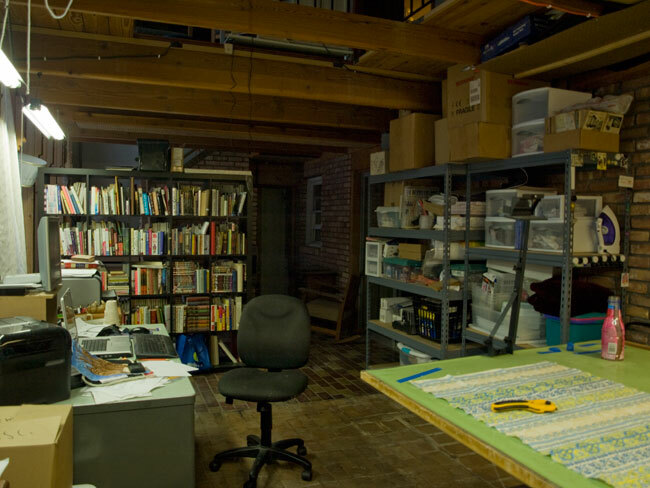 This… is my studio. Yes, it’s a mess. I admit it. I’m not sure it does me any credit to say that this is 45 minutes cleaner than it was when I got home from work yesterday. When we moved about a year and a half ago, my dear husband went searching for a house with space for a studio, then found a way to fit the rest of the household in what was left. Still, I have not yet figured out where everything should go, so it’s piled on shelves and tucked into corners. 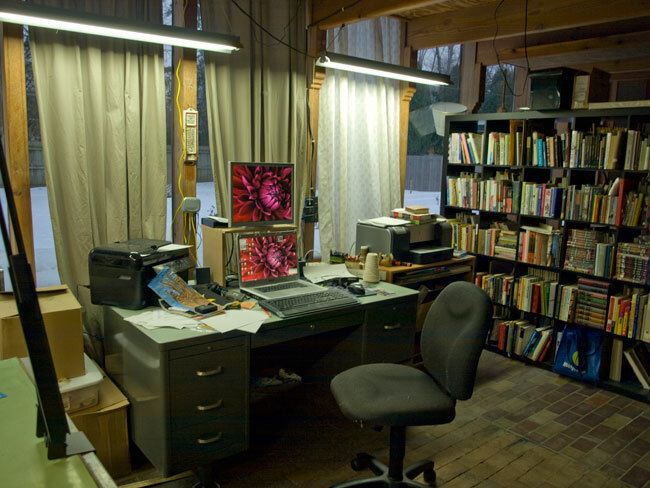 Here’s why: my last studio was custom designed and built by my husband and me to maximize storage and work space. 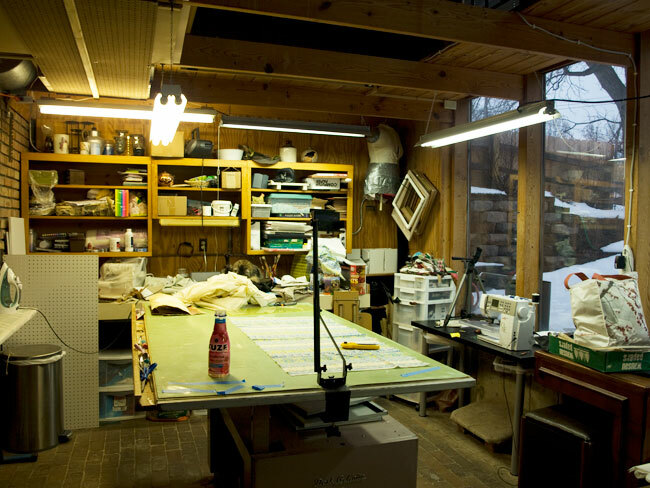 I designed it for two sewing machines and a serger, my enormous drafting table, all of my books, and my embarrassingly large collection of fabrics and art supplies, plus a design wall. However, it had no windows. This studio has an entire wall of windows. Natural light! Hooray! So, what’s a girl to do? In the second and third photos you can see overhead flat storage space that DH and I rigged up under the floor joists. It works great, as long as I store things in there that I do not often need. There are several closets in the adjoining laundry/workout room that are stuffed full of bins and boxes, but we all know that out of sight is out of mind. So… other than getting rid of all this stuff (horrors!) does anybody have any storage suggestions? Let me know. Or, just show me your own mess, since misery looooves company. If you can’t laugh about these things, what else can you do? This entry was posted in Humor, studio and tagged art, art supplies, mess, obsession, organization, postaday2011, storage, studio. Bookmark the permalink. 2 Responses to Show me your mess! I daren’t post photos of my mess, it would give some people heart attacks! Thanks. The windows are quite nice. Organized? Not quite. I haven’t been able to find anything in there for ages. I’ve decided to remedy the situation by using stuff up until I have enough room to organize.